St. Louis!!!!!!!! Fortheculturestl.com launched April 1, 2018 and in only THREE months it hit OVER 20,000 views! It's time to celebrate with a KICKBACK!!!! 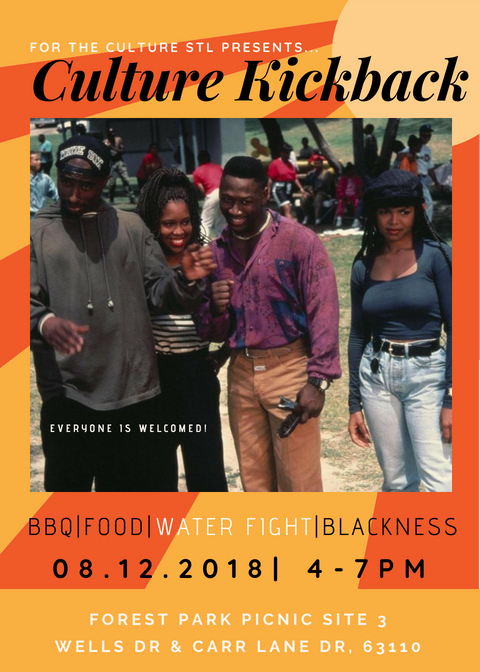 Come out for food, fun, and culture. Be prepared for a water fight, karaoke and more. Meet us in Forest Park @ Picnic Site 3 located at the intersection of Wells Dr and Carr Lane Dr 63110 to build community while having a whole lot of fun. Open to everyone and all ages!!!!!! See you soon. VENDORS ARE WELCOMED PLEASE EMAIL FORTHECULTURESTL@GMAIL.COM!! !